Despite the exaggerated limb twisting and hyperbolic displays of emotions, Japanese animation must be credited for its accurate, street-by-street depiction of Japan. Compare reality and fiction with today's Groupon to Tokyo, Japan. 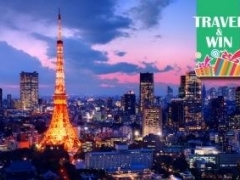 For $508 per pax, you get a 3D2N 4-star Hotel Metropolitan Tokyo Stay and 2 Way Japan Airlines Flight (worth $975). For $758 per pax, you get a 4D3N 4-star Hotel Metropolitan Tokyo Stay, One Day Disneyland Passport and 2 Way Japan Airlines Flight (worth $1199). Touted as an urban oasis of comfort, the 4-star Hotel Metropolitan Tokyo welcomes visitors far and wide. This pristine abode delivers the best in hospitality and services, including a fitness club, beauty salon and bar where guests may unwind after a day of fun and exploration around Tokyo. Currently located adjacent to the Ikebukuro train/ subway station, the hotel provides easy access to commercial and cultural hot spots. Say goodbye to wasting precious time navigating through a maze of streets, and hello to luxury, convenience and comfort when you check into Hotel Metropolitan Tokyo. Jet off to the Land of the Rising Sun and encounter all things kawaii. Hop off the subway and let your inner fan boy (or fan girl) run wild at Akihabara, also known as Tokyo's Electric Town. Stock up on the latest technology, from sophisticated cameras to intricate gaming devices that will send the likes of George Lucas on a run for his money. Anime and cosplay enthusiasts, find yourselves at home with tons of merchandise facing you at every turn, be it a limited edition figurine or an elaborate cosplay outfit that's just screaming to be carried home to your wardrobe. While you're in geek paradise, do treat your senses to the full Japanese experience. Take a walk off the beaten track and dine in one of Tokyo's many street stalls, each and every one offering a delectable serving of ramen, sushi, and more. If you're in the mood, why not check out Akihabara's famous maid cafes, where giggly girls in French maid getups dish up food and company with an oh so cute twist? Next, conquer one's peak with a day trip to Mt Fuji. Scale to the highest point in Japan and be rewarded with a breathtaking view of this truly unique country where old meets new, and East meets West to form a perfect blend of cultures. Don't forget to take your camera along. Finally, watch your childhood come to life at Disneyland. Iconic characters like Mickey Mouse and Donald Duck await to greet you as you enter the Kingdom of Magic, where a plethora of rides, parades, and shows will dazzle you from start to finish. And yes, wearing those crazy cat ears you purchased is permitted in here. Reviews Very close to JR station, staff very helpful, staff English good, many restaurants around, spacious rooms, comfortable beds"
Every thing was fine no problems re booked for return to Tokyo so they kept my main baggage as I was traveling around. There is a limousine shuttle bus to the hotel from the Narita airport 3000 yen door to door no hassle. Staff were great"